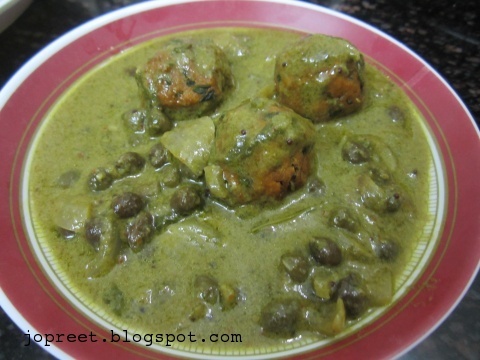 Hare Chane Ki Dal aur Methi Muthia, methi dumplings soaked in green chickpeas curry, a very flavorful and delicious curry which can be made low calorie by either steaming the dumplings or trying paniyaram pan to prepare muthia / dumplings. I came to know about this recipe through a Hindi serial “Kuch toh log kahenge” telecasted in Sony Channel. The main character “Dr. Ashutosh” loves this recipe and our heroine “Dr. Nidhi” prepares this to impress him. This recipe sounded new to me. I searched for it on internet and got the method from “Tarla Dalal” cooking website. From then i was trying hard to prepare it but as usual no time, since it takes much time to prepare. Finally i made it and everyone loved its taste. Combine all the ingredients for methi muthia in a mixing bowl. Add little water and knead well. Keep it aside. Prepare the green paste by grinding all the above mentioned ingredients (under Green Paste section) adding little water. Keep it aside. Pressure cook green chickpeas with 2 cup for 5-6 whistles. Once done, drain the water completely. Dissolve corn flour in coconut milk and keep aside. Heat oil in a kadhai or handi and temper mustard seeds. Add chopped onions and saute a while. Add green paste and coconut milk. Add boiled Channa, turmeric powder and salt to taste. Cook it covered for 10-15 mins till the raw smell goes. Meanwhile, Heat oil in another kadhai and make small balls of the methi dough. Fry the balls in oil till it turns golden brown. Remove the pieces from the heat and keep aside. Or for low calorie version, steam muthia or use paniyaram pan to prepare methi muthia. I have tried deep fried and paniyaram pan version. Once the channa is ready, add the chopped coriander leaves and remove from the heat. At the time of serving, add methi muthia to the curry. Serve hot with any indian bread variety or rice. Very very neat and nice presentation PT. Looks delicious….my mom make this with hara chana……slightly diffrent her recipe…. I love this methi flavoured muthias and the curry looks delicious. It is the first time a TV serial made some thing delicious. Looks perfect. lovely curry with delicious muthiyas..interesting recipe! Mouth watering recipe. I will definitely try this one!